Harbor Compliance Archives - Communicate! Your relationship with your donor is like any other relationship: if you want to keep it healthy and strong, you have to put in some work. There are several reasons why a donor might file for divorce. The question is, what can you proactively do to keep the relationship going? To renew your donors year after year, you want to make the relationship a priority and build trust. Fundraising compliance is a key to building that trust. Why does fundraising compliance matter for your donors? There’s an excellent chance that your organization is incorporated in one of the 41 states that require charitable solicitation registration. There’s an even better chance that you are soliciting gifts in one of those 41 states. Are you surprised? Don’t be. You’ve done an incredible job with your programming. Your donors are impressed and uplifted by how you communicate the impact of their gifts. They have found you and your financial values are compatible. As unofficial ambassadors they are sharing you with their networks, spreading your message, expanding your outreach, and asking prospects to give. That’s great. That’s also solicitation. It’s not just about where you are; it’s about where the people you’re asking reside. Are you casting a wide net, asking everyone connecting to your website and through social media to participate in your annual giving? Have you made your Donate Now button prominent so that anyone, anywhere, can find you and give? Maybe some of your donors have moved away, but remain loyal givers. Some of the best, most loyal givers are helping you out and, on your behalf, asking others to give. If they live in one of those 41 states, you need to comply with that state’s laws. Don’t trip over technicalities as the money comes rolling in. Register before you ask. When that generous donor sends you a gift–because Husband Ricky talked about your work or Wife Lucy sent them an email–that gift landed them in your pipeline, no matter where they live. You aren’t going to leave money on the table. You’re going to build the relationship and ask again… and now you’re soliciting. 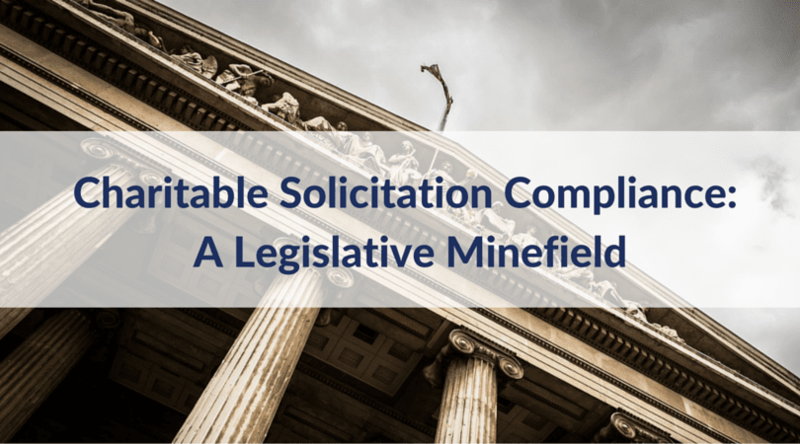 Determine if you’re soliciting in a state and make sure you’re meeting all of the necessary requirements. Remember these four key steps and keep your fundraising compliance on track. Research: Know your status in each state and you can easily map your path to compliance, including which applications to complete and what fees may be charged. Apply: Make sure you are preparing the correct forms in the most streamlined and cost-effective manner. Monitor: Follow these applications through to approval, for your donors’ peace of mind. Renew: Track due dates and fees so that your renewals are on time and complete. Instill confidence in your donors so their focus stays on your mission. Transparency and accountability preserve the trust you’ve built. You want to be proactive about preserving your harmonious donor relationships while honoring your valuable and desperately finite time. Take a good-faith step toward relationship success and invest in compliance. Ify currently serves as President of the Board of the Pennsylvania Association of Nonprofit Organizations (PANO), President of the Administrative Ministries Team at Doylestown United Methodist Church, and Board member for the Bucks County Women’s Advocacy Coalition. She is also a member of the Doylestown Branch of the American Association of University Women and Doylestown Rotary. Kindness begets kindness. Nonprofits inspire individuals to do good too. Nonprofits address problems that are too stigmatized for politics, often more quickly than government can do. There’s a nonprofit for everybody. Just ask. Nonprofit staff sacrifice a lot to bring about change. Too much, in fact. Thank them in the coming year by supporting higher salaries! Nonprofits bring communities together. It could be the broader community, or it could be creating a community out of people who care for the same issue. Nonprofits foster an appreciation for the arts. And not only arts nonprofits. Many the youth program makes poetry, music, drawing, or videomaking a part of people’s lives. It’s easy to cheer the do-gooders. It’s harder to remember the people who make the do-gooding possible. Nonprofit technology providers, like Capterra, Bloomerang, and TechSoup. Nonprofit consultants about compliance and reporting, like Kayak Consulting Group and Harbor Compliance. Community foundations, like the Cambridge Community Foundation or the Appalachan Community Fund. They give money and advice. Resource centers like Associated Grantmakers of Massachusetts or the Center for Nonprofit Excellence. They share information and training. When we talk about nonprofit work, we rightly put our clients first, and feature or front line direct service staff second. These people and what they do make the best stories. They show how our nonprofit is making the change in the world that is its reason to be, in the first place. Once in a while, though, look behind the curtain. See the allies without whom nonprofit work would be difficult or impossible. Today, I say thank you to them. Enjoy your Thanksgiving Day! Fundraising Tuesday: Register Before You Fundraise! Charitable solicitation registration is often overlooked by nonprofits. The complexity and bureaucracy of the application process can be enough to dissuade even the most conscientious organizations from being compliant. However, despite its challenges, charitable solicitation registration is an important part of any prudent organization’s compliance program. Here’s a story that shows you why. A large, well-established Harbor Compliance client went through a wholesale change in its executive team. As is common with personnel transitions, there were a few communication breakdowns. Unfortunately, several of them occurred with the various state agencies responsible for charitable solicitation regulation. By the time the change in the executive team was complete, the nonprofit’s registrations in over a dozen states had lapsed and needed to be brought back from 2-5 years of noncompliance. The organization was hit with per-state penalties of up to $6,000 across multiple jurisdictions. Thankfully, we were able to work with the state governments to negotiate reduced penalty fees, since their lack of compliance was not willful. However, that didn’t stop California from assessing penalty fees to their directors with the provision that no funds raised by the organization could be used to pay. 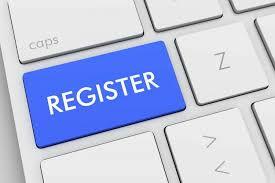 Fast-forward to today and the organization is back to being properly registered in all 41 states that require registration. However, their board and their officers would all tell you the risks of noncompliance far outweigh the cost of a well-structured compliance plan bolstered by the consultative support of a responsible service company. Fundraising compliance is one of the most vexing areas for nonprofits. Harbor Compliance created a free white paper to help your nonprofit executive team and board make sense of the requirements. 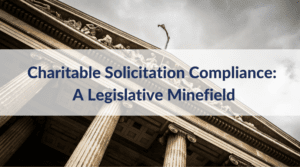 The Charitable Solicitation Compliance white paper will answer your questions on the registration and renewal requirements, the state applications, the Unified Registration Statement (URS), online fundraising and “Donate Now” buttons, as well as the consequences and penalties for noncompliance. Education is a key element to helping your organization become compliant. Downloading the white paper is a great start. Enjoy! Click here to download the white paper now! Author Bio: Brock Klinger is an Account Manager for Harbor Compliance, a leading provider of compliance solutions for organizations of all types and sizes. Headquartered in Lancaster, Pennsylvania, Harbor Compliance partners with organizations in every state and over 25 countries abroad to help solve the most challenging compliance problems. Brock is an Eagle Scout and in his spare time volunteers with Boy Scouts of America.